At the 2015 Design Automation Conference in San Francisco, Accellera, Si2 and the IEEE co-hosted a session looking at upcoming standards for system-level power as well as seeking input on how to proceed. The cooperation between the groups has been welcomed as many users and vendors are keen to avoid the split that occurred with the RTL power-intent standards CPF and UPF. Vishnyakov added: “Each one of these disciplines kind of work in parallel so each one does their own thing. The software guy starts working with power when they get the hardware but, with that, there is no real feedback to the hardware and by the time we have the hardware there is not much time to to change it. You are then very close to launch. In principle, improved visibility through the architecture and design flow is what the combination of IEEE P2415 and IEEE P2416 and an overhaul of UPF/IEEE 1801 should enable. The result may be a situation where early power analysis is used to generate valid power domains and controls that can be assembled into an SoC design without having to stitch them together by hand using today’s somewhat manually intensive processes. Since UPF was developed, hardware engineers now have a clearer idea of how power domains are architected and used, which can drive better assumptions in the partitioning, synthesis, and layout tools. Conversely, those implementation subtleties have a major impact on the construction of the system-level power model. Ahmad Ansari, principal engineer at Xilinx, pointed out that an early assumption behind UPF’s structure has turned out to be false and therefore increased implementation complexity. For example, there are big differences between physical and functional dependencies when it comes to defining and controlling power supply rails. “You may have two blocks that coexist in one [power] island but which belong to logically separate subsystems,” he said. For its work on modelling standards, Si2 has adopted an approach based around the idea of power ‘contributors’ developed with Nagashyamala (Nagu) Dhanwada and David Hathaway of IBM together with North Carolina State University researchers Rhett Davis and Harun Demircioglu. Instead of using circuit-level models to compute tables that can be used in system-level simulations, contributor modeling treats the components of power consumption as separable elements. Examples of power contributors include the channel and gate leakages of single transistors, the leakage through a given transistor stack and the charging of capacitance as the gate switches. 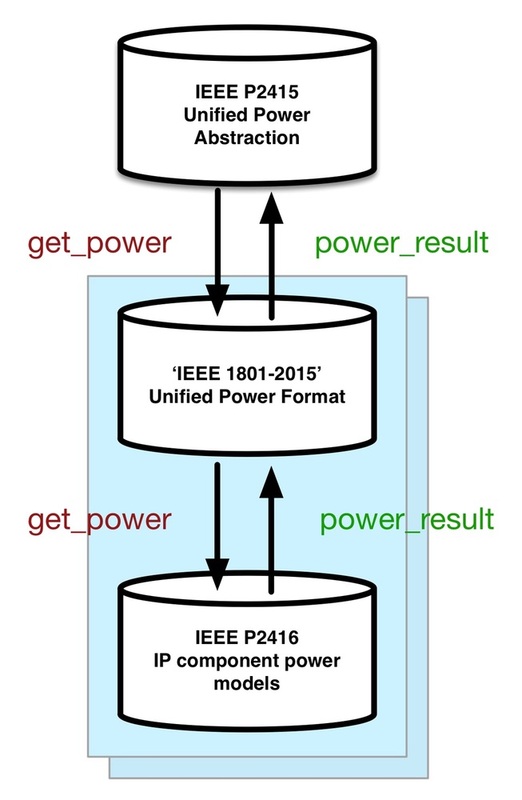 A low-level power model combines those contributors to come up with a power estimate for a given cycle. In principle, these models can be made independent of power, voltage and temperature (PVT) variations. Although the PVT contributions themselves need to be factored in for a given process and library for a final, accurate model, the contributor approach allows the benchmarking of different circuit and algorithm strategies against each other. Si2 has provided this modeling technique to the IEEE P2416 working group. “We see these standards groups as being recipients of the work that we do,” Frenkil said. The P2416 standard focuses on state-based power data and modeling, said Stan Krolikoski, Accellera secretary. IEEE P2415, on the other hand, is for providing power abstractions of assembled components and blocks to simulation tools. Vojin Zirojnovic, P415 chair, said the standard would be used to define the chip’s power-related features such as clocks, power rails and other power controls and sequencers at a high level. These allow the testing of different power-control algorithms to see how the system-design performs under different loads and also sanity-check the sequences to ensure that a key block required for other functions is not turned off by mistake. “If we can build a bridge into 2415 and abstract it for the software guys, that would be the vision.” said Vishnyakov. To that infrastructure, the intention is to add commands that define legal power states and state transitions. These will be coupled to power functions that compute the consumption of each state based on a set of variables fed to algorithms implemented by EDA tools but which will not be defined in UPF itself. As a result, the future UPF would support higher-level modeling work, potentially taking data and specifications defined using IEEE P2415 models and feed those down into directives that implementation tools use to create power domains, sequencers as well as to support SoC verification. Pangrle described scenarios that system architects and designers could explore with an idealised workflow that could be enabled by the three standards. He took the example of a multicore design using different dynamic voltage and frequency scaling (DVFS) strategies. One strategy supplied the same voltage to each of the active processors, the other allowed the voltage for each to be different, which would incur a higher area overhead for the additional supply rails and voltage converters. Additionally, the power-management algorithms could be implemented in either software or hardware. A transaction-based model would, using power models, evaluate each of the combinations and deliver a set of graphs that show power against time for each under different workloads, such as video decoding and web browsing. 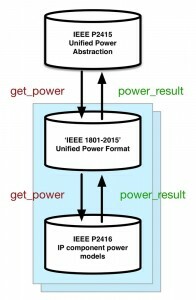 Power models would also potentially show up subtle interactions, such as the situation with Big.Little-style architectures where, on paper, it makes sense to shut down a core and migrate its workload but where the energy cost of migrating the data stored in cache makes that a higher-energy option for certain workloads. Although there is a lot of standardization effort to be completed across no less than three groups, momentum appears to be building for a better system-level power modeling environment that could feed all the way down into implementation tools.